A rural town in central Yukon. Known for its beautiful scenery, recent mining history and, of course, the golf course that runs right through town! Click here for a virtual guide of Faro. 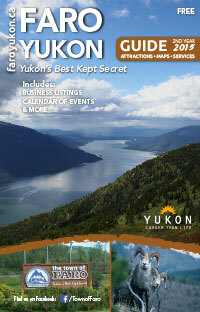 Faro is often called the pulse of the Yukon. That’s because it's located in the centre of the Territory, and for decades it was the beating heart of Yukon’s economy. But those who have lived in or visited Faro know the real reason: it embodies the spirit of the Yukon’s raw wilderness beauty and the warmth of its people. Although the mining activities in the world’s biggest lead-zinc mine pit, approximately 25 kilometers from the town site, have ceased, the Town of Faro has revived itself as a growing quality destination for visitors to the Yukon who appreciate the stunning beauty of the Campbell Region and Faro’s full service community. Faro can be reached by traveling one of the most scenic highways in the Yukon: the Robert Campbell Highway. Traveling the South Alaska Highway north, you have the choice of driving the Campbell Highway from Watson Lake (400 km), or follow the rugged South Canol Road driving North wards from Johnson’s Crossing and turn west at the Campbell Highway intersection. If you are coming from either Whitehorse or Dawson City on the North Klondike Highway, take the turn off at Carmacks (182 km). Faro is home to Fannin sheep, which live only in the Yukon. About 100 Fannin sheep live in the Faro area. Their winter range is close to the Faro townsite, along the south-facing slopes of Mount Mye, while their summer range is further back in the mountains. The best time to view the sheep is between mid-September and mid-June, when they are on their winter range close to town. At the Mount Mye Sheep Centre, visitors can watch the sheep without disturbing them.